So back in May, my old buddy, Tommy Vext, asked me if I would do an acoustic set of cover songs for a performance at a benefit show for our mutual friend, Tim No 37, at Tammany Hall in NYC. I wanted a more full sound, so I asked God Forbid guitar player, Matt Wicklund, to play second guitar. Our other old pal, Acey Slade (Dope, Murderdolls, Joan Jett), came in to play bass on a couple songs. We weren’t very well rehearsed, but we had a really good time, and apparently the set went over well enough that the venue offered us a residency to do a rock/metal full cover set. We rallied the troops and have been hard at work to put the most badass show together. It kicks off this Wednesday at Tammany Hall, and we look to play there every week. We’ve also enlisted my fellow School of Rock brethren and drummer, Moe Watson, as well as New York City rock royalty Ms. Jenn City (Kittie, Suicide City) as a second bassist. I’ve always wanted to do something like this. Jamming out some of your favorite songs with your friends is as good as it gets. 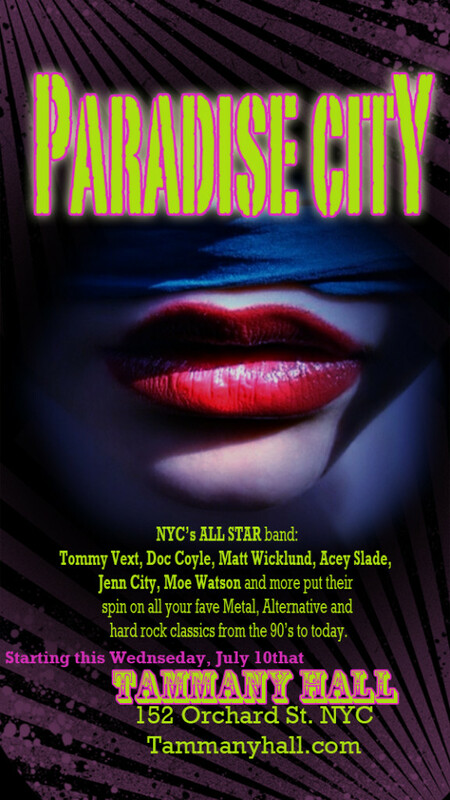 It’s going to be rock, it’s going to be metal, but above all, Paradise City will be about having fun, so spread the word and come out to Tammany Hall on Wednesdays. We will also be looking to take the party on the road, so be on the look out.